The goal of the BMP project is to provide an relative baseline of data for conservation practices that are on the ground between the 2007 to 2010 time frame. This data can be used for extensive watershed modeling, documenting historic occurrences, and future practice tracking. To supplement data from the Iowa BMP Mapping Project, the ISU GIS Facility has developed an online web page where results are available for download by each subwatershed in Iowa. Results can be used by WMAs, County SWCDs, NRCS, Cities, and County Engineer/Secondary Road offices and others to evaluate the existing BMPs in their watersheds. The Agricultural Conservation Planning Framework (ACPF) is a set of Geographic Information System (GIS) based software tools used to identify potential locations for different types of conservation practices. It was developed at the USDA/ARS National Laboratory for Agriculture and the Environment in Ames, Iowa. It includes tools to process the LiDAR-based imaging and elevation models for hydrologic analysis, which then allows a series of prioritization, riparian classification, and conservation practice placement tools to be utilized. The ACPF Tools identify agricultural fields most likely to deliver runoff directly to streams. They also map and classify riparian zones to inform whole watershed riparian corridor management and estimate the extent of tile drainage in the watershed. 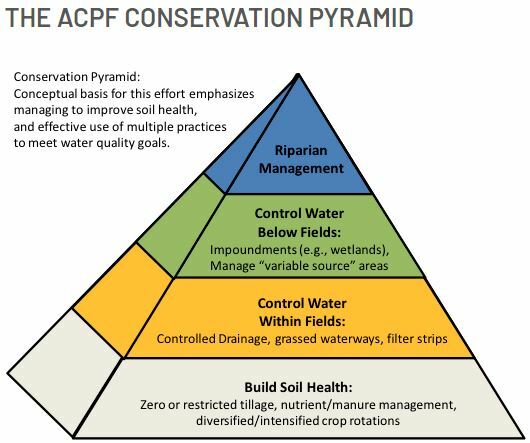 Conservation practices mapped using ACPF Tools include those that reduce, trap and treat water runoff, and improve water quality. The ACPF Tools identify and map grass waterways, saturated buffers, denitrifying bioreactors, contour buffer strips, nutrient reduction wetlands, and water and sediment control basins (WASCOBs). Graduate students and staff from the University of Iowa analyzed each HUC-12 subwatershed in the UIR Watershed using ACPF Tools. Results are used throughout the UIR Watershed Resiliency Plan, and can be used by WMAs, County SWCDs, NRCS, Cities, and County Engineer/Secondary Road offices and others to guide future projects and analyze potential conservation on the landscape. Public infrastructure, particularly roads and bridges, in the UIR Watershed often experiences major damage due to flooding. Out of consideration for, and to help with management of, this public resource, a variety of different analises of UIR Watershed roads and bridges was completed by the Iowa DOT and the Northeast Iowa RC&D Watershed Planning Team. The first analysis examined bridge condition in the UIR Watershed. An Infrastructure Analysis of Bridges was completed to detect bridges that are at a higher risk for flood related damage based on age, average daily traffic, structure type, and condition. GIS analysis was conducted using data from the National Bridge Inventory and Iowa DOT. For More information on bridge condition in the UIR Watershed click here. The Upper Iowa River Watershed Bridgesheds, defined as the area of land that drains to each bridge, were identified by the Northeast Iowa RC&D Watershed Planning Team using ArcGIS Spatial Analyst tools. Each bridgeshed was overlaid with results from the Iowa BMP Mapping Project to illustrate the relationship between existing conservation implementation and the area of land that drains to specific downstream infrastructure/bridges. Detention structures, including ponds and water and sediment control basins (WASCOBs), have the ability to hold water on the landscape and thus provide increased protection for downstream infrastructure, especially during high flow and during flood events. Bridgesheds were then spatially analyzed by subwatersheds to categorize the UIR subwatersheds based on presence or absence of existing conservation practices. Different conservation partners may utilize this analysis in different ways. Some conservation partners may prioritized conservation outreach, technical and financial assistance to those subwatershed that have few exiting conservation practices. These are shown in red on the map below. Other public entities may choose to prioritize bridge repair or investment in public infrastructure to the subwatershed/s where conservation practices are already in place, thus protecting their investment. The Northeast Iowa RC&D Planning Team also used results from the ACPF tool (explained above) to determine potential “on-road structures” in the UIR Watershed, more specifically, pond structures in close proximity to roads were considered a potential location for an on-road detention structure. On-road structures are are designed and most typically incorporated into county road infrastructure. They are typically placed at a location in the landscape where a county roadway “dips” in elevation within the landscape, at a low elevation point along a roadway. County Engineers in the UIR Watershed prefer to locate these structures on secondary gravel roads, high up in the watershed, where overland runoff is intermittent or occurring only during rainfall events. To create the on-road structure, the road is built up to create a dam that can hold stormwater runoff temporarily. A special outlet culvert is installed in the structure so the structure will temporarily hold back water during a large rain event and then release it at a reduced volume over a few days. An easement/agreement between the landowner and the county is established allowing the water to be temporarily held on the private land. Responsibility for inspection and maintenance is also assigned. These structures have multiple benefits for the county, the public and the upstream and downstream landowners. They may improve the safety of the roadway, protect downstream public and private infrastructure and reduce flow during rain events. They may also be designed to create a pond, provide water for livestock, and/or provide a water source for the fire departments (dry hydrant). These options are particularly desirable in rural areas where other water sources are scarce. This analysis is useful for landowners, County Engineers and Boards of Supervisors, City Councils, Fire Departments, rural road users, taxpayers, and anyone else looking to improve existing roadways, increase public safety, protect downstream private or public infrastructure, reduce streambank erosion, create new water sources for livestock, wisely use taxpayer dollars, or to accomplish many other goals. IIHR—Hydroscience & Engineering (IIHR) and the Iowa Flood Center (IFC) developed a hydrologic assessment of the UIR Watershed that provides the WMA, local leaders, landowners, and watershed residents with an understanding of the hydrology – the movement of water – within the UIR Watershed. This assessment provides valuable information for any and all stakeholders looking for guidance with strategic decision-making and/or those who are hoping to efficiently address flooding and water-quality concerns. Information in the hydrologic report informs all other sections of the watershed resiliency plan, making other types of analysis more relevant and/or providing context for decision making. It also helped planners quantify the hydrologic and other results of proposed actions. The Upper Iowa River Watershed Hydrologic Assessment helped the WMA Board and partners better understand dynamic rainfall patterns, watershed system hydrology, interactions between surface and ground water in karst systems, and how this UIRW Resiliency Plan must be responsive to related changes and therefore updated regularly.